Laundry Liquid has to be about the easiest product you can make in your kitchen. It is so easy [and cheap!!!] once you make it, you’ll be a convert for sure! I first started making my own laundry powders and liquids a few years ago when my baby daughter developed eczema and my husband started getting itchy at night time. After washing all of our clothes and sheets in homemade laundry liquid the itchies have gone and the eczema is well under control. In fact, it only flares up when we go on holiday and use store bought powders! Too good to be true, huh? You can find any all of these ingredients at your local bulk food shop. Take your own measuring cup to use! 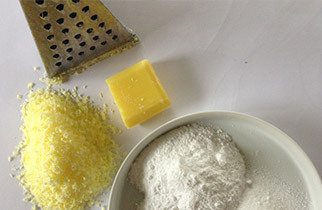 1/2 Bar of Laundry Soap:: Grated. Makes: Approximately 7L of Laundry Liquid. Pour 1.5L of water into a large pot with the grated laundry soap. Heat on low and stir until soap has dissolved. Stir in washing soda and borax for a few minutes until thickened. In a large bucket, put the 1L of hot water in the bottom. Slowly pour thickened soap mixture while stirring. Add the last hot 5L of water very slowly while continuing to stir and mix well. Handy Tip: If you want to add essential oils, now is the time to do it! Lavender or Eucalyptus are great ones to try our first for your washing! Cover your bucket with a towel and let it sit over night. In the morning give it a good stir and pour into milk bottles. Handy Tip: I only 3/4 fill my bottles so I can give them a good shake before I use them. And that’s it! Easy peasy huh?! Let me know if you make your own laundry liquid and what you think! It’s so simple! Do you prefer liquid or powder for your washing? Leave me a comment and let me know!